That Ghana is one of the best tourism hubs in Africa is, indeed, not an overstatement. Beyond being the most peaceful country on the continent, it also has some of the best attractions for tourists from anywhere in the world. Talk about awe-inspiring mountains, epic road trips, enormous national parks, monuments, beautiful waterfalls, sceneries and night life, the list really is endless. NEWS-ONE brings to tourists who are yet to visit and those who are already in town some of the best destinations in Ghana with focus on Accra, the capital. This is part of an initiative by the office of the Ministry of Tourism Arts & Culture to attract tourists to the best destinations in Ghana. You can be certain that whatever you’re looking for in your trip, Ghana can offer it and even more. Indeed, there is no other city like Accra. It’s a place full of life and excitement. It’s a city of enormous history, monuments, arts and crafts, cultural diversity and more. It is also the economic and administrative hub of the Greater Accra Region of Ghana. From spick and span malls, the crashing surf, the cocktail terraces, the chugging exhausts, the pavement hawkers, and swish hotels, all combine to create a thrilling and a hospitable city for visitors. In the next two years, tourists should expect a spectacular tourism enclave called the Marine Drive. It will transform the beachfront stretch from the Osu Christianborg Castle to the Arts Centre into a vibrant business and tourism enclave that will not only transform the city’s skyline and spur tourism growth. If you’re looking for a dose of historic events, the Kwame Nkrumah Mausoleum & Memorial Park is one place for you. Situated off the High Street in Accra, it also symbolises the genesis of the history of Ghana. The beautiful park has a lot of history concerning the first president of Ghana. The great works of Dr Kwame Nkrumah is well explained within the park and the mausoleum tells it all. It houses the body of Dr Kwame Nkrumah and his wife, Fathia Nkrumah. A full statue of Dr Nkrumahwearing a cloth in bronze is sited at the exact location where he proclaimed Ghana’s independence. The design of the mausoleum represents an upside down sword which symbolises peace. From the main way leading to the mausoleum is a spring on either sides of the walk way and also peacocks around. Each spring has seven bare-chested, squatting statuettes of flute blowers, who seem to welcome visitors to the park. The water on the other hand is a symbol of life. Its presence conveys a sense of immortality for the name Nkrumah. It shows that even in death Nkrumah lives on in the hearts and minds of generations here and generations yet to come. For a better feel of Ghanaian culture, also visit the national museum. It was opened by the Duchess of Kent in 1957, and is described as the home to some of Ghana’s most absorbing historical finds. The museum gives an opportunity to tourists to travel through the country’s history from both an archaeological and ethnographic perspective. Located in the heart of Accra, the museum features excellent displays on various aspects of Ghanaian culture and history. The displays on local crafts, ceremonial objects and the slave trade are particularly noteworthy. The Independence Square is one of the favourite spots in Accra. It is usually a busy place during 6th March Independence Day parades, the purpose for which it was constructed in 1961. 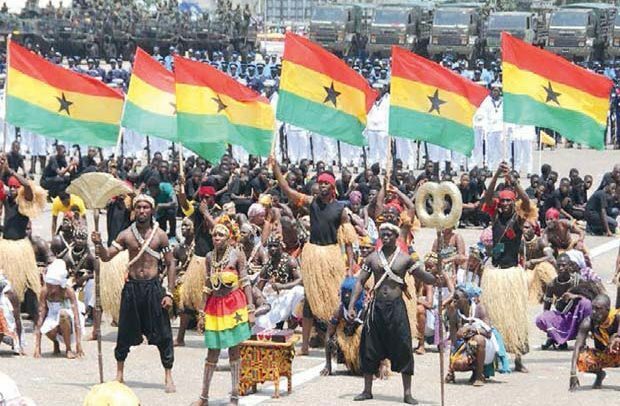 For citizen who grew up in the environs of the square, they don’t only get to be part of all major national public gatherings and national festivals that take place there but also engage tourists who visit. Bordered by the Accra Sports Stadium and Kwame Nkrumah Memorial Park, it is often described as a public square. Visit the square, also known as Black Star Square, and spin around its vast, empty expanse of concrete overlooked by spectator stands. The square boasts of the Independence Arch and the Black Star Monument, also known as the Black Star Gate. A statue of a soldier faces the Independence Arch symbolising the Ghanaians who lost their lives fighting for Ghana’s independence and also the Liberation Day Monument. Also one of the places to visit while in Accra, Jamestown has more deep secrets and history of Accra. It originated as a community that emerged around the 17th century British James Fort, merging with Accra as the city grew. But it currently looks like one of the poorer neighbourhoods of Accra. It is full of beautifully dishevelled colonial buildings, clapboard houses and corrugated iron shacks but it remains vibrant. For a great view of the city, one has to climb to the top of the whitewashed lighthouse. There are several boxing gyms in Jamestown that have nurtured a long line of local kids into champions. It also serves as a hub for filming, as majority of filmmakers used the city for their location. 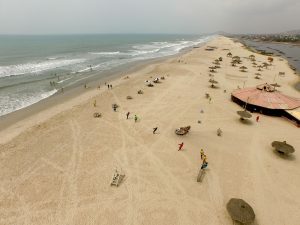 Accra is not just filled with monuments, fun activities and good food but also beautiful beaches. For your amazing beach walk, and all the other beach relaxations you want, one of the best hangouts is the Bojo Beach. It is located west of Accra and very clean. On arrival, there’s a small entrance fee to pay, and you’ll then be rowed across a clear strip of water to a pristine strip of beach, where there are sun loungers and refreshments. If you want to stay the night, the Bojo Beach Resort has suitably swish rooms. Bojo Beach Resort features 35 comfortable rooms, almost with a private balcony overlooking the beach as well as some picturesque mountains. Sometimes during weekends, there are concerts at the beach to make the experience even more exciting. Recently when American actor Boris Kodjoe and his family came to Ghana, the Makola Market was one of the places they visited. 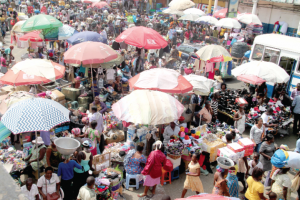 The market also holds so much of Accra’s history. It is not modern as one may think but it stands tall as one of the biggest markets on the African continent. It has everything Africa you may want to buy. For new arrivals to Africa, it can be an intense experience, but it’s a fun out there. Don’t miss the Makola Market for anything. Experience it! The Centre For National Culture in Accra is simply called ‘The Arts Centre’. 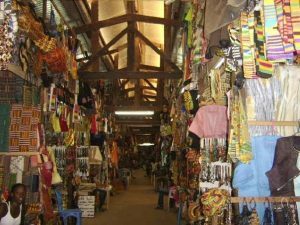 It’s Ghana’s biggest craft market and very easy to find. It is situated right next to the Kwame Nkrumah Memorial Park. 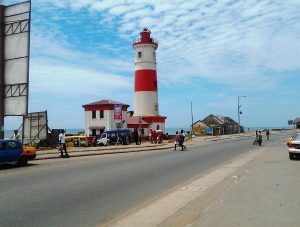 It is virtually the tourist heaven of Ghana. It has got everything from woven kente cloth, wooden sculptures, earrings and other fashion accessories, the latest in African Attire fashion and arts and crafts from all over Ghana. The Christiansborg Castle is also known by many as the Osu Castle. It was the seat of Ghana’s government until 2013 when the office of the president was moved to the Jubilee House, also in Accra. The castle is located off the shores of the vibrant township of Osu in Accra and some metres away from the Independence Square. Built by the Danes around 1659, it is now being used as a presidential museum. Close to the Castle’s junction is the 28 February Christiansborg Crossroad shooting cenotaph. It’s a memorial to Sgt Adjetey, Cpl Attipoe and Pte Odartey Lamptey, ex-servicemen who were shot and killed in 1948 by one Superintendent Colin Imray of the colonial police, while they were marching to the Christiansborg Castle to present a petition to the British Governor, Sir Gerald Creasy. You definitely cannot miss a visit to the castle which holds a lot to the history of Ghana.